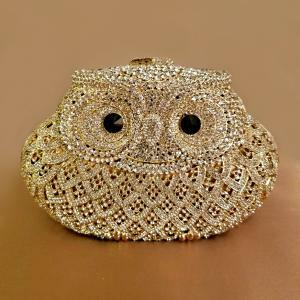 Shaped in the form of an owl, the crystals of this small clutch look just like diamonds! And like a diamond, you can wear it anywhere. The crystal detail is incredible and covers the exterior of the bag completely (6" W x 3.5" D x 4" T). Opens from the top and snaps closed. Includes 18" gold chain that can fasten onto the bag as a strap, or be removed completely.